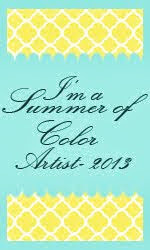 Today is the reveal for the blog hop, The Colors of Spring, hosted by Sally Russick. Sally makes wonderful beads and she decided that it would be fun to make some up using the 2012 Pantone colors. Since I'm delighted that the Pantone color of the year is Tropical Tangerine, I knew I wanted to participate. I've loved the color orange for a long time and it makes me so happy to see it as color of the year! Also, I really love Sally's beads, so it was a win-win for me! The set of beads consisted of a lentil, which we were requested to use in our design, and two round beads and two long beads. I decided I would make a wire necklace so that I could use some of my recently learned wireworking skills. I used two copper beads and two fire polished beads along with all but one of the long beads from the set. 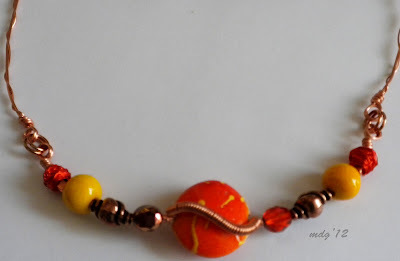 I also used fine gauge orange wire to make two wire wrapped beads. Out of all of that I made a central component on 18 gauge wire. As you can see I put a wire wrapped swirl over the lentil bead. I was going to use a chain for the necklace but decided to use loosely wrapped 18 gauge wire links to make the necklace. I thought it looked better with the clasp. I had decided to use one of the long beads as part of the clasp and I'm pleased with the way it turned out. Once again I used a simple swirl of wire to keep the bead in place and add some more interest to the clasp. I'm really pleased with the way this necklace turned out. 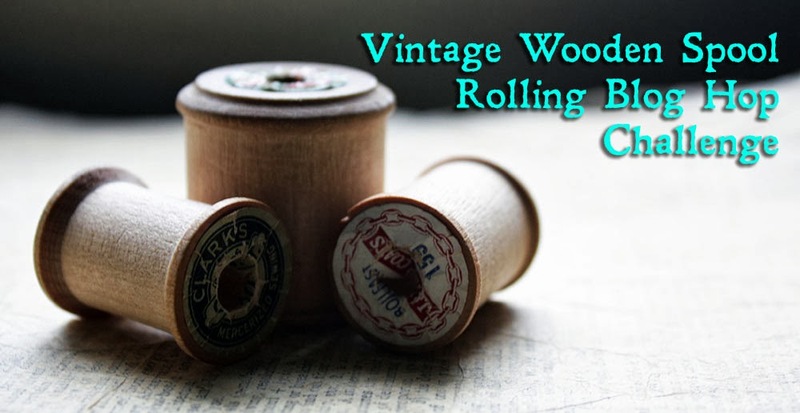 Sally's beads are great and I want to thank her for coming up with the idea for the blog hop and hosting it. 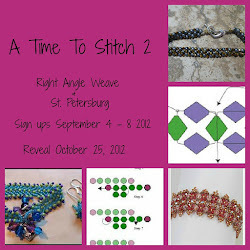 Be sure to visit all the other participants to see what they did with their Pantone inspired beads. Maryanne what a warm beautiful piece you have created. With the bright colors in the retail market this summer you are spot on. You have added some very nice wire work to your necklace. Oh I love the zingy citrus/sherbert colours in this - It makes my mouth water! And what a clever clasp! Well done. 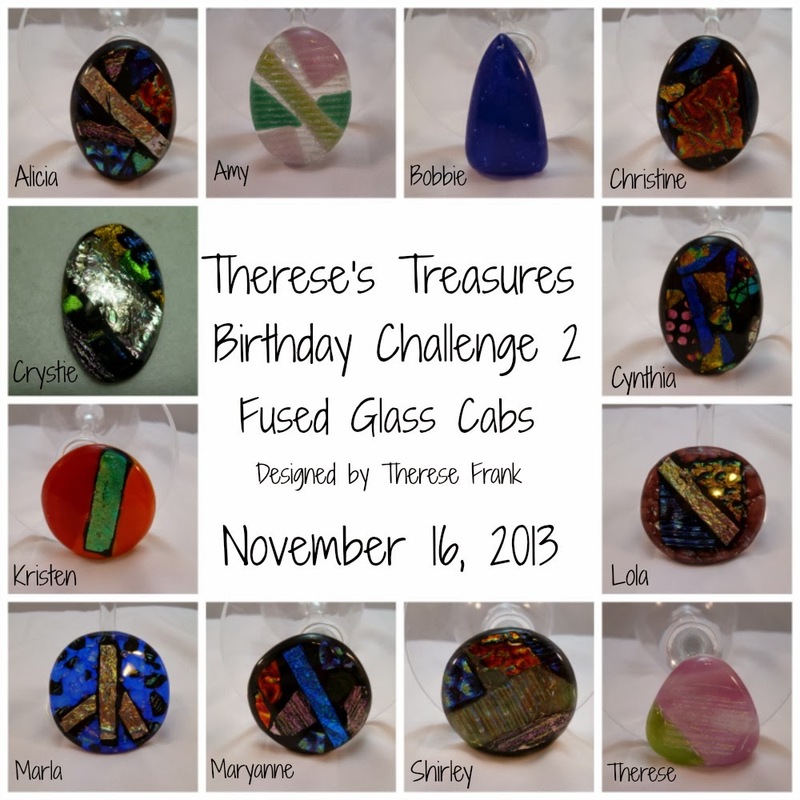 Your focal bead is awesome! i love how she added additional colors to the tangerine! And your wire wrapping is so unique! Beautiful job! Congratulations on learning, and conquering, a new skill! Your necklace is just gorgeous! I love the colors and the design. Your clasp, and the way you showed off the focal is just perfect! What a great piece, your wire skills are wonderful! The necklace is so summery and fun. Maryanne, I love your necklace very pretty and nice wire work. The pendant and clasp are gorgeous! Did you add the splash of yellow to the lentil bead or did Sally? i love the wire wrapping and the colors of your piece! it is like a bowl of summertime fruit! bright and happy and juicy! so pretty!!! Maryanne! Your necklace with all those vibrant colors is so cheery and fun!!! Beautiful!! The wirework is wonderful, the copper is perfect and that clasp is such a brilliant design!! Great job!! I'm so glad that you loved the beads I sent and THANK YOU so much for participating in the hop!!! Your necklace is so FIREY! It really turned out wonderfully. You should be pleased. I especially like the way you did the clasp. Super job! So spring and all my favorite colors. Love the wire. Love love tangerine. Love the vibrant look of this necklace! So warm and HAPPY! 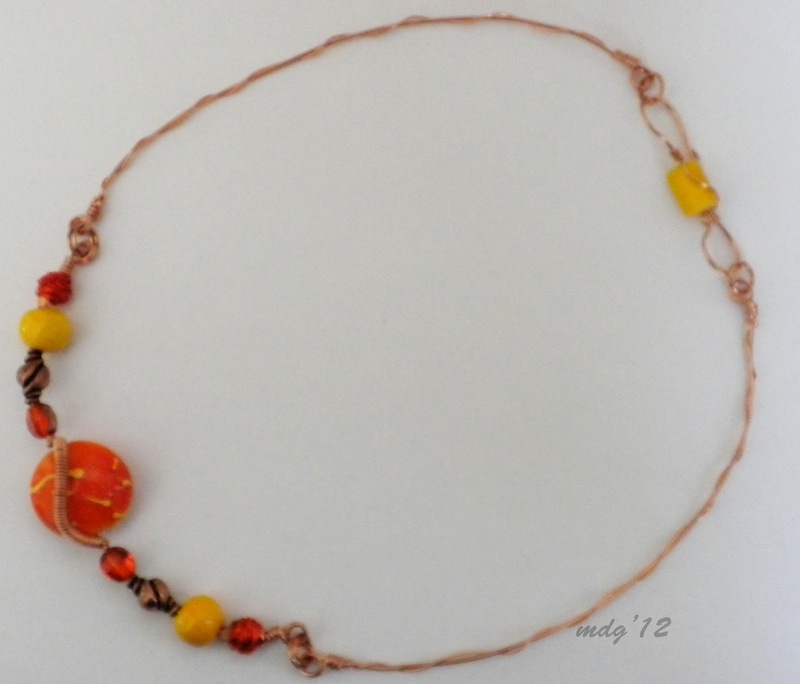 The copper was a perfect match for your beads- I love all of the ways you used your new wire skills to make such a wonderful, colorful necklace! I agree with Erin, The wire work i wonderful. Great way to accent this design. What a bright fun piece! Hey Maryanne - great job, and great wire work! Pretty and fun! I like how you used the bead in the clasp. Very nice. You received a very different focal with two colors instead of one. That turned out so cool! I especially like the coiled swirl over the big orange lentil bead.